There are many ways to include a pet in a wedding but a few of them have been shown on this blog. So, if you are a soon-to-be-married couple who is wondering about the possible ways to include your four-footed family member in your wedding, let us help. Here are some of the coolest ways to involve pets at your wedding. Being an owner of the pet, you must be aware of what they can ask before, during, and after the wedding ceremony. Keeping all their needs in mind, you must have an arrangement for the same. Keep a bowl of fresh water or milk ready to avoid dehydration of your pet. If it is a summer wedding, make sure there is a place where your pet can rest and have a bowl of water. Afterall, your pet is as important as any other wedding guest. If you have a pet, you cannot leave them aside while posing for a perfect wedding photograph. These days including pets in the wedding pictures is a trend. There are so many cute poses that a couple can make while holding their pets. You can give them some kind of signages to hold or make them wear a formal dress to grab the attention. In short, including a pet in the wedding album is a great idea that every to-be-married couple must think about. Walking down the aisle is one of the significant wedding moments. The bride usually takes an entry with the best man who walks by her side till she reaches the end of the altar. If you have a pet, you can add a nice twist to your entry. What if your pet walks down the aisle a few minutes before your entry? 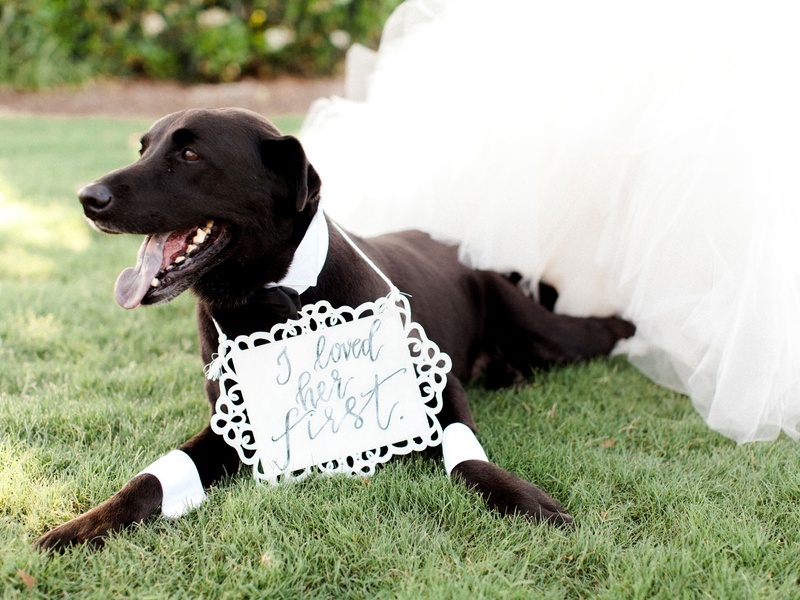 With a signage in the mouth, the pet can inform your guests that the bride is about to come. And after this, you make an entry with your best man. Isn’t it something really cool? You must give it a try. Every wedding is different and so as the emotions attached. You might have certain thoughts on your mind about the biggest day of your life. What type of wedding dress would you wear, what formal attire your guests will wear on and so on? But, if you have a pet you should always plan a bit more. You can actually dress up your pet in the same dress code as your guests are expected to wear. Imagine a pug with a suit and pant on the wedding day? Not only this will add some charm to your wedding ceremony but will significantly add some wow factors in your wedding album. As you are now open to some of the tried and tested ideas to include pets in your wedding, go ahead and make your pet outshine on the happiest day of your life. Let them shout out loud and bring a plus factor on your wedding. Hope these ideas work for you. Do let us know your thoughts in the comment box. Leave a comment down below and we would revert at the earliest.